Thomas B. Clarke [1848-1931], New York; sold to Peter A. B. Widener, Lynnewood Hall, Elkins Park, Pennsylvania; inheritance from Estate of Peter A. B. Widener by gift through power of appointment of Joseph E. Widener, Elkins Park, Pennsylvania; gift 1942 to NGA. The interior edge of the rim is white biscuit, devoid of glaze. On the outer edge of the rim the glaze darkens to form a slight halo encircling the mouth. A few dark spots and pinholes are scattered on both the interior and exterior, as well as a slight eruption in the interior. 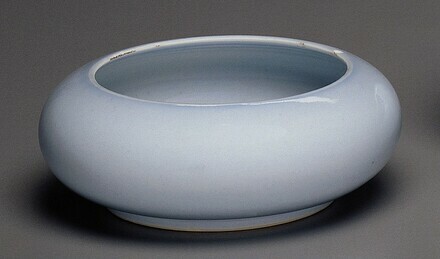 The very pale glaze ends neatly above the especially smooth unglazed surface of the foot. 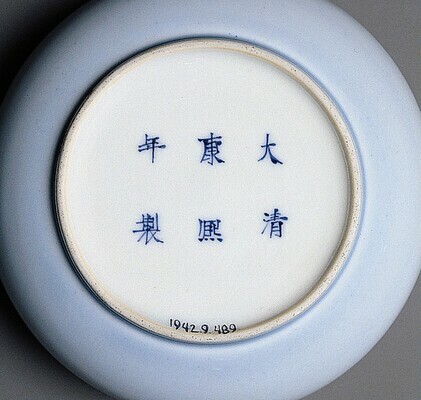 Christensen, Erwin O. Chinese Porcelains of the Widener Collection. Washington, 1947 (rev. ed. 1956): 30; 1956, 30. Bower, Virginia, Josephine Hadley Knapp, Stephen Little, and Robert Wilson Torchia. Decorative Arts, Part II: Far Eastern Ceramics and Paintings; Persian and Indian Rugs and Carpets. The Collections of the National Gallery of Art Systematic Catalogue. Washington, D.C., 1998: 98-100, color repro.